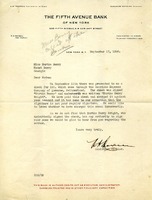 In this letter The Fifth Avenue Bank of New York writes Martha Berry to tell her that on September 11th a check came to them from Switzerland signed Martha Berry and underneath written Martha Berry Wright. They cashed the check, but realized that it was not MB's usual signature, and wanted to see if it was in fact her who signed the check. John W. Frothingham sends a post card with a European street scene in Berne on the Rue du Marche. He says that his secretary wrote to him to tell him that a box of candy came for him at Christmas. He is sorry that they couldn't enjoy the candy, but he and his wife are in Berne where his wife is taking a "long course of treatment for her terrible malady," a problem with the pituitary gland.